If “solar is winning” why has Germany just put the kibosh on it? I recall that Germany used to build 7 GW of solar a year under a market-based feed-in tariff. Now we get close to nothing. This doesn’t make any sense. Cost of new solar has gone down. Why stop now? Two rounds of auctions have already been held, but with disappointing results. According to Renewables International: “The government originally hoped that auctions would bring down the cost of solar, but that goal has now been abandoned.” The hope that the auctions would bring down solar costs was frustrated by high bid prices, with solar bids coming in at up to €89.30/MWh, not that much less than the Hinkley Point strike price of £92.50. And Hinkley generation is of course dispatchable while solar isn’t. So the hyped headlines are a little out ahead of the facts. But the hype itself is warranted [emphasis mine]. I’ve been watching David hype wind and solar in this manner for well over a decade now. It’s no wonder a recent poll found that Americans have somehow been given the mistaken impression that wind and solar combined are producing 20% of our electrical energy. They’re off by a factor of four. And as is typical for Roberts, thoughts of the impact on natural ecosystems of an energy source that usurps seven times more land per unit energy than nuclear never enter his mind. If you can find enough places to put it all without obliterating natural ecosystems like the Ivanpah solar thermal plant just did and does, great. But the cheapest land tends to be that occupied by what is left of nature, and human nature being what it is... 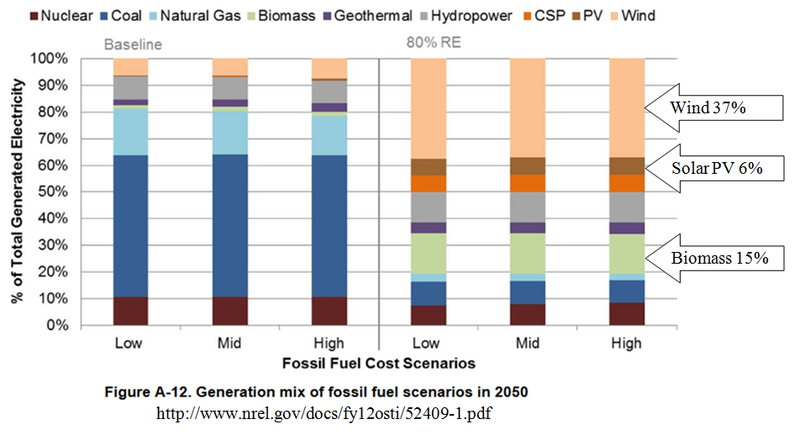 The four-volume mega-study by the NREL put solar at 6% by 2050. In China and other emerging nations, population, GDP, and electricity demand are all rising quickly. That’s why emerging nations are installing more renewable capacity than their Western counterparts. Together, wind and utility-scale solar are now the cheapest available energy sources in the places that are building the most of them. So, any guesses as to why he left nuclear out of that discussion? See Figure 4. I’d call that a bluntly disingenuous statement (although I suspect it’s been taken out of context). Hydro isn’t cheap in Tucson (where I’m presently writing this piece), solar isn’t cheap in Seattle (where Dave and I reside), and wind is only the cheapest in very windy places. Places without much hydro capacity, wind velocity, and solar insolence, won’t find that hydro, wind, and solar are cheaper than other sources. Look to Germany’s cost of implementing wind and solar for real world evidence of that. And that is a good thing in those sunny places because utilities will actually seek out solar based on cost rather than be enticed to use it with subsidies or mandated to use it by government fiat. But, it will only be used when the sun shines in the sunniest places, and, like wind, will only be used as a fuel reduction device for natural gas power stations. See Figure 5. Lazard’s annual report is very widely read. Lazards report, like any report, needs to be taken with a grain of salt. Unlike the many government reports on LCOE, Lazards, a for-profit entity, has many dogs in this fight (a strong incentive for bias). Read this blog post about their methodology. Our second remarkable fact is tucked away there on row five: Cutting edge solar has nosed ahead of natural gas. On an LCOE basis, onshore wind is the cheapest form of electricity; utility-scale thin-film solar PV is the second cheapest. Think about that for a minute. The cleanest [A low carbon source of] energy is the cheapest [has, according to Lazards, a lower LCOE in very sunny places than natural gas]. That’s a pretty big deal [an incremental improvement]. I took the liberty of editing the above sentence to make it more accurate. David’s remarkable fact, the basis for his article, actually first showed up in last year’s Lazards report (9.0). And to make matters worse, it had thin film solar $3 cheaper last year than this year (same for natural gas). Lazards 8.0 didn’t even mention thin film. David assumed that Lazards had been showing thin film getting cheaper every year and so has extrapolated that trend into the future. If he realized that it was shown as cheaper last year, he would have had to assume the opposite, that it’s getting more expensive (which it isn’t). Oh well. See Figure 6 . This competition between renewables and existing power plants helps explain why US utilities (and fossil fuel companies, and conservatives) tend to dislike state-level renewable energy mandates. I have to say, as I often do, the above sentence also doesn’t make a whole lot of sense to me. Who, other than a masochist, likes it when the government decides to mandate the consumption of a competitor’s product? Utilities dislike renewable energy mandates? I think what David really meant to say was that utilities don’t care for mandated consumption of wind and solar when that mandate makes it more difficult for them to remain fiscally solvent (wind and solar are worthless without, utterly dependent upon, fiscally solvent grid operators and dispatchable energy sources). Utilities would love (and sometimes do love) those mandates if they improve their bottom line. All energy sources compete with each other. Historically, coal’s biggest competitor has been nuclear, now it’s largely gas. Hydro competes with everyone but has limited potential for expansion. Oil won the competition for transport hands down over natural gas. Solar and wind, not only compete with each other, but when cheap enough, also compete with natural gas and on and on. And above we have yet another largely nonsensical sentence. Natural gas, a fossil fuel, is nuclear power’s competition, not solar at 1% and wind at less than 5% concentrated principally in especially sunny or windy areas respectively. But remember: It’s [Commercial and industrial (C&I) rooftop solar] is not competing with alternative forms of new generation [wind and utility scale solar], it’s mostly competing with existing [fossil fuel and nuclear] generation, relative to which it is wildly expensive. Wind and solar are not competitors? Given the choice of buying solar panels or wind turbines, an entity is likely to opt for turbines in a windy, cloudy, location or solar in a windless, sunny location, much to the protestations of the respective turbine and panel salespersons. And doesn’t every new power station have to compete with existing ones? The above statement is quite accurate but I want to point out that the bone he threw to nuclear looks like a last minute edit job (it’s at the end of the sentence, in parenthesis, and the punctuation is wrong). And as I mentioned above, in an earlier article and in this one as well, he refers to subsidies for nuclear (a de facto price on carbon) as bailouts. Wind and solar are intermittent resources (the wind isn’t always blowing, etc. ), which means the more of them you add to the grid, the more “firming” of the grid you need to compensate. That can be done through flexible backup generation (usually natural gas), energy storage, “load shifting” (moving demand to times of high wind/sun), or a variety of other techniques. If energy storage were really economically feasible, nuclear would profit from its existence just as much as wind and solar. Load shifting is also a technique that would benefit nuclear as much as wind and solar. 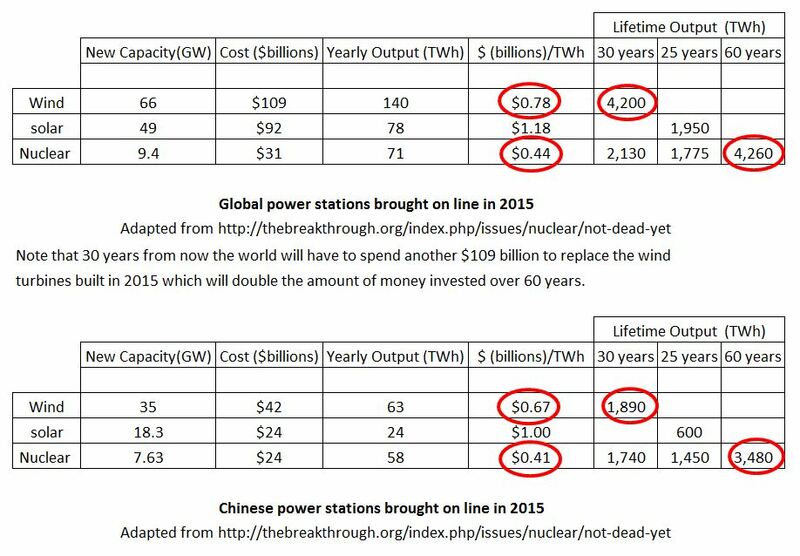 Missing from David’s list is the construction of billions of dollars worth of additional transmission infrastructure to export wind and solar energy spikes to far away areas not being impacted by similar wind and solar spikes (because they have not installed too much wind and solar). This cost is unique to wind and solar and it’s huge. See Figure 2. Making the grid more flexible will come at some cost. In light of the $30 billion annual cost of the expense of the German experiment, which is far higher than the cost of new nuclear, I’m not sure that “some” is the proper adjective here. Also see Figure 1. It has to be done eventually, and the end product will be much more effective, but getting there will cost money. Wind and solar necessitate spending that money. Actually, it doesn’t “eventually” have to be done at all and if by “effective” he means effective at reducing emissions, judging from the German and California experiments to date, removal of nuclear from a grid always results in more emissions and higher costs. 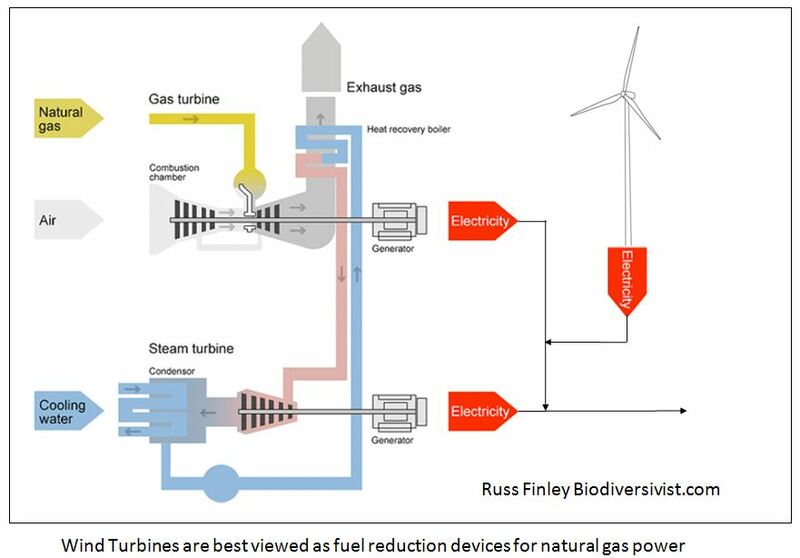 If you use wind or solar as fuel reduction devices for natural gas power stations there will be no need for extra transmission lines to export power gluts caused by too much solar or wind capacity to grids that do not already have too much wind or solar (yes, you can have too much of a good thing). Replacing existing coal plants in situ with nuclear as China is doing with some of its coal plants would actually be much more effective as France and Sweden proved long ago. Utility-scale solar has gotten so much cheaper, so fast, that it is now directly competing with new wind and natural gas plants. That is something no one would have dared predict even a few years ago. If solar costs keep dropping, then in a few more years there will be no remaining ambiguity: Utility-scale solar will be the cheapest form of new electricity almost everywhere. Where it isn’t, wind will be. And rooftop solar will be edging out natural gas. By everywhere he means only in really sunny places (very roughly speaking, half as much sun = twice the cost). And when he says it won’t be, wind will be, he means in not-so-sunny but really windy places (very roughly speaking, half as much wind = twice the cost). Everywhere else …not so much, and it’s in those places you will find more nuclear. That still leaves developed countries with the dilemma of how to deal with no-longer-competitive fossil fuel and nuclear generators, in which utilities have millions of “sunk costs.” But solar will be like an acid bath for them, eating away from the margins inward. Wait a minute; this article is about utility-scale solar. These solar farms are owned by, wait for it …utilities. If wind and solar are truly more profitable in a given area, then closing non-competitive generators isn’t a dilemma, it’s an opportunity for a utility to reduce costs. If dumping a sunk cost is more profitable, they will dump it. If not, they won’t. The acid bath analogy is utterly nonsensical. If solar is profitable, it won’t be, like an acid bath, eating away at the utility that built the solar farm; it would be an asset to the utility. Now throw climate change into the mix. You don’t want natural gas taking out a zero carbon energy source like nuclear. Solar, barely at 1%, primarily in sunny places, is not a threat to nuclear, and that’s a good thing because we sure can’t let low carbon energy sources take out other low carbon energy sources while coal sits there watching. And keep in mind that if wind topped out at around 35 percent and solar topped out at, oh, 25 percent, together they would cover 60 percent of total electricity demand. That would be an absolutely remarkable feat. In truth, say Jenkins and Trembath, there's reason to think the rule of thumb is too generous and VRE [Variable Renewable Energy] will top out at maybe 50 percent of global electricity. Even if they're right, though, that would represent an energy revolution, not some grim disappointment. Still, it would leave 50 percent of electricity demand to be covered by some combination of other low-carbon sources: hydro, nuclear, biomass, geothermal, and coal or gas with carbon sequestration.